Athletes competing: Tim Auth, Matthew Cuttell, Coach Jason Sturdyvin, Coach David Quinn, Coach Erik Rankin, Rosie Fasching, and Nate Fillers. A slight cool morning greeted over 500 age group and collegiate athletes on the campus of the University of Illinois at Champaign to close out the 2013 triathlon season. The race consisted of a 300m pool swim (in a gorgeous outdoor 50m pool) followed by a 14.4 mi bike and a 5k run. The race started off with our favorite timer Eric Arndt of It’s Race Time giving us the green light. Athletes hopped in the pool in 3-5″ increments. New reaper Matt Cuttell turned in a huge swim and will only get better. Quick on his heels was Coach Quinn. Coach Sturdyvin and Rankin did their best to have virtually identical swim times. Tim finished his swim not agitating a grumpy rib cage and Rosie was the top female swimmer. All in all, the reaper athletes had a great swim! The bike is deceptively grinding and the wind was never really friendly (why is that true for most races around here?). Coach Sturdyin turned in the top bike time with Coach Rankin on his heels. 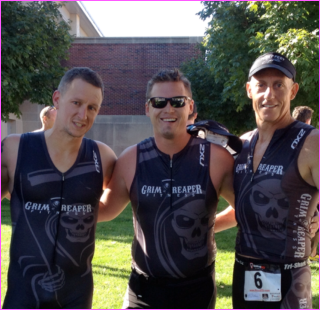 The whole team did a great job and turned in the solid bike times that the Reaper athletes are known for. The run was was full of twists and turns but was sunny and well marked. Overall, the run is a great way to see campus and the finish-line comes quick. Coach Quinn turned in a fantastic 9th overall place and took 3rd in the 45-49 AG (very deep field). Coach Sturdy ended on his heels in 10th overall place and a 2nd place finish in the 30-34 AG. Coach Rankin came in next finishing 19th overall and 2nd in the 35-39 AG. Matthew Cuttell knocked roughly 11′ minutes off his time from last year (this dude is gonna be a monster next year)! Tim continued his march on ripping time off and joined Coach Sturdyvin, Rankin, and Matt with setting new PR’s on this course. Overall, a great way to finish the tri season. So looking forward to the 2014 race season and tearing up the Tri-Mom, Tri-Harder, Rev 3, and Ironman circuit next season. Thanks for a great year team. For those of you not training with us, what are you waiting for? Make 2014 your year! We will again have a sprint, OLY and half iron training programs as well as, half and full marathon programs. 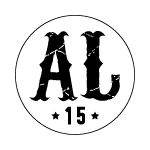 Don’t forget you have a few days left to join the group at The Athlete Factory in Bloomington for a 10 week Strength Camp. Come join the Reaper crew to get stronger for the 2014 race season!